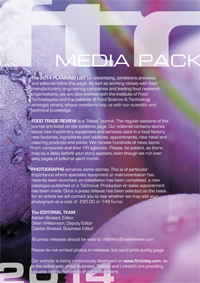 A long time ago FTR was what is nowadays called the media sponsor of the First International Food Science and Technology Congress at Imperial College in London, whose President was Lord Rank, the leading figure of the food industry in the UK at the time. This became known as the first IUFOST Congress. As a young man I was introduced by my father Raymond Binsted, Editor & Proprietor of FTR to Dr, now Professor M S Swaminathan. Years later I was to be greeted by Dr Swaminathan as Director General of the International Rice Institute in the Philippines when I was visiting the country with a small group of experts advising President Marcos on what food products could be manufactured in the Philippines and exported to Europe to help replace the income from the giant American Airbase which was already being reduced in size. Dr Swaminathan reminded me of our meeting all those years before and took our small group on an excellent visit of all the facilities and the rice growing fields before lunching together. In 1986 the research facility was still working hard to improve the harvests of rice across the ASEAN countries to fend off famine. Countless millions of humankind owe their lives to this work to this day. The continuous efforts to improve GM crops are what will feed nine billion people in the coming years. What packaging can supermarket customers recycle these days? For the last few years there have been enormous efforts made in this country to reduce packaging materials used to protect our food and make it safe. We now have thinner cardboard outer packaging, thinner cans for our canned foods, ever lighter-weight glass containers without mentioning the plethora of plastics materials that have been reduced in thickness. There are now more packs than ever that tell you that they cannot yet be recycled, only in a few local council areas, or only at your local supermarket. So many jobs have been lost in the packaging and converting industries through quantity reductions in the UK. How much time is wasted by all those committees and government-funded organisations to arrive at this situation. We all want to do our bit to save the planet apparently, but we are stymied by regulations that do not necessarily work. We still want to buy a pack of food that does not fall apart. A pack that can be opened safely without the paper ripping, the foil tearing, or simply the weight of the product being too much for the container. There is still a great deal of work to be done. We are lucky in this country as we enjoy a British food industry that has a huge pool of talent from food technologists, engineers, packaging technologists and production people who make sure that our food is safe. Other countries look to the UK to lead in this area, let us make sure that it happens. Henkel, an adhesives manufacturer for the packaging industry, showcased numerous innovations and proven adhesives systems at Interpack 2014. Committed to food packaging safety, they have also launched an initiative to support the fight against global food wastage. At last it looks as though the supermarkets have realised that we do not all want two packs for the price of one, the famous BOGOF deal, so hopefully for most people needing less rather than more, we shall now reduce the amount of food waste. At least it is a start. It is noticeable that the pricing strategy at supermarkets is now all over the place. It is little wonder that the food manufacturers and particularly the suppliers of fresh fruit and vegetables are not that happy with their ‘remuneration’. Next, up we come to my hardy perennial, packaging and packaging waste. It appears that quite a few local authorities in the UK now collect from households, who are required to sort into different bins and boxes, but the collectors now put everything together – for re-sorting later presumably. There are many new developments in the packaging industry and undoubtedly we will be able to see even more at the forthcoming Interpack Show in Düsseldorf this May. There are numerous new ideas for creating packs for the ever-increasing ready meals markets of the world as the new product developers of our food industry deliver ever better products, ever more adventurous dishes. The burgeoning middle class in India and China are creating an expanding market for better quality products that are better packaged, in particular they are looking for prepared meals. It worries me sometimes to read, hear or see those who should know better, telling us how we could produce much more food here in Great Britain so that we could replace food imports and banish food miles. Most of us in the food industry know that the land area in this country already supports a larger population that most if not all of the countries in Europe. A recent suggestion was that Scotland could vastly increase meat production. Excellent meat, but the Highlands do not have much suitable grazing with so much granite around. Another proposal was to double fruit production – which would actually mean higher prices since we cannot compete with the vast amounts of excellent quality imports that arrive by the shipload from Canada, South Africa and Australia. Can we double the vegetable production in this country. Why not dig up all the golf courses, bowls greens, tennis courts, parks and football pitches just as was considered during the Second World War. I know that because my father, Raymond Binsted sat on the committee of five people with the Minister of Food to find ways to feed our nation under siege. Plenty of people out there want to tell our industry what to do – most of them with little knowledge of how UK PLCs largest industry by far, operates. FTR’s June Issue 2013, page 403, ‘Appy Drinks’ Nickelodeon characters juice range’ article, is one example of how Tetra Pak is tackling recycling. More and more people are talking about food waste and how to resolve the problem. Both the food industry and the supermarkets, as well as food distributors are dealing with the problem rather well. If food manufacturers have mislabelled product or have underweight or overweight rejected product then these can often be recycled, relabelled, or repackaged in their own factories. Other products and overstock, subject to certain parameters, are donated to charities working with the needy. Some food factories and some larger supermarket sites already have their own anaerobic digesters or they have regular collections by the waste and recycling industry. Agriculture, by and large, uses its own waste for feedstock, for spreading on the land, or again using anaerobic digestion to create their own electricity or heating. People tell us that there are millions of tonnes of food wasted in the UK every year. This is hardly correct as so much already has a ‘home’. I believe that the great fear for our industry is that the academics will spend their time and use Government funds researching unnecessarily, and the politicians will debate incessantly, without either listening to the experts working in our own industry who are already solving the problems of excessive food waste. Our industry does not create food waste for fun as that costs money and wastes time; so leave us in peace to get on with our research and our projects without even more legislation. The topic of the moment is food sustainability, which by any other name, is how to feed an expanding world population. Part of the challenge is to improve the nutritional composition, the quality and the quantity of food from agricultural sources and to prevent the enormous post harvest losses in so many countries due to pests and to lack of transport infrastructure. What is being discussed at the moment are the breeding technologies for grains and oil seeds; how to create new crops using traditional grafting and cross pollination techniques. Let us explore the future of genetically-modified crops which can give such huge increases at harvest; their safety in the food chain; How the wider use of these foods can be properly explained to consumers, is currently entertaining the minds of those much more knowledgeable than myself. We do not want another fiasco as we had with irradiated foods when certain forms of food poisoning could have been wiped out at a stroke. except for the appalling publicity put out by misinformed people in the 1960s, and propagated by the mass media at the time: The ramifications are still with us today. We have to continue with the steps being undertaken by the scientific community to create new test methods for the authentication of foodstuffs and their ingredients in the whole supply chain. We must find new analytical methods to prove provenance beyond doubt to assuage the curiosity of people encouraged by the mass media and by TV cooks. We must find new methods to stamp out locusts, and to eradicate weeds and bacteria in our universal agricultural crops today, so that people can eat tomorrow. I go back to my mantra: Let the scientists get on with expanding out harvests, take the politicians, the quangos and the do-gooders out of the equation, so that our industry, the largest industry and the largest industrial employer in the UK, can help to provide good, nutritious food to feed the world in the coming years. 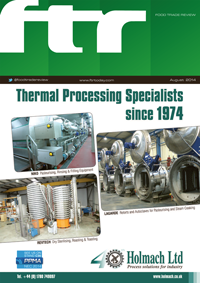 The FTR Journal and ftrtoday are published by Attwood & Binsted Ltd. “Our Family Publishing House since 1862."